It’s been said so many times that it sounds like a cliché, but taking a hike into the Grand Canyon is literally a Walk Through Time. Nowhere else on the planet is such a great amount of Earth history exposed for us to see and understand. The Grand Canyon is not the deepest or even the most extensive canyon system on Earth, its rocks are not the oldest, and yet within the canyon walls one has a more complete look at geologic time and the history of our continent than anywhere else. The most exciting thing about the canyon is that the stories of the formation of our continent are laid out there for us to see, and stories are really what geology is all about! Before you start your hike in, take a few minutes (without your pack! ), and hang out on the rim and look, really look, into the canyon. What you see there is a literal textbook of geologic principles that can help you better understand not just the canyon, but your own backyard as well. Illustrated in the canyon walls are some of the main principles and processes of geology. To begin with, you can see representatives from all three rock families. At the very bottom, as the canyon drops into the mystery of the Inner Gorge, are dark black schist and gneiss, and light pink granites. Schist and gneiss are metamorphic rocks, formed under intense heat and pressure, and literally changed from their original makeup. Granite is a type of igneous rock, formed from a molten magma and cooled deep below the surface of the Earth into solid rock. Superposition states that the oldest rocks in a stack of rocks are at the bottom, the youngest at the top (this assumes they haven’t been messed with by faults). So what this means for you is that as you hike down the trail to the Colorado River, you’ll be going back in time. The wild thing about this is that the youngest layer, the Kaibab Formation on the rim, is still older than the oldest dinosaurs! Lateral Continuity states that layers will extend in all directions laterally until something causes that layer to disappear. So the colors you see on the canyon walls are not just stripes on the surface, these are layers that stretch across the landscape, sometimes for hundreds of miles. The only reason we can see them here is that the river carved the canyon and exposed them. Sometimes a fault or erosion can cause a layer to end, or sometimes that layer just dies out because the environment it formed it ended (more on that later). Original Horizontality states that sedimentary layers are laid down horizontal, or flat, and that if they are not flat, that must have happened after the layers were laid down. So if you look into the canyon at the head of the Bright Angel or the Kaibab Trails, you’ll see flat lying sedimentary layers at the top half of the canyon, but partway down, just above the Inner Gorge, you’ll see layers that are tilted, or inclined, to the east. That means that these layers were tilted before the upper layers were laid down on top of them. As you look into the canyon, you also notice that the layers are all eroding in different shapes. Some form hard straight cliffs and some form soft gentle slopes. The reason the canyon is so wide and so impressive is that its walls are made of many different types of rock. Hard rocks like schist and granite form narrow gorges. Limestones and sandstones form sheer cliffs, and mudstones and shales form soft slopes. As the soft slopes melt away under the rains (few as they are! ), they melt backwards, and retreat from the edge of the Inner Gorge. As they undercut the hard layers above them, those layers crumble, and large blocks of talus tumble onto the soft slopes, protecting them from erosion at least for a while. In this way, the whole canyon is widening. While the river does the cutting down, other forces help widen the canyon. Rain, ice, plant roots, even burrowing animals, all help to weather and erode the rocks of the walls and widen the canyon.If the canyon were composed entirely of limestone, we would have a 5,000-foot deep, very narrow and sheer gorge, instead of the stair-step spectacle before you. Notice also the colors of the layers as you look into the canyon before you start your hike. White, black, rosy pink, deep brick red, purplish brown, grey green, yellowish-green, silver gray… Every rock color says something about the environment in which that rock formed, or the conditions to which it was subjected after it was formed. We’ll discuss this as we go down the trail. 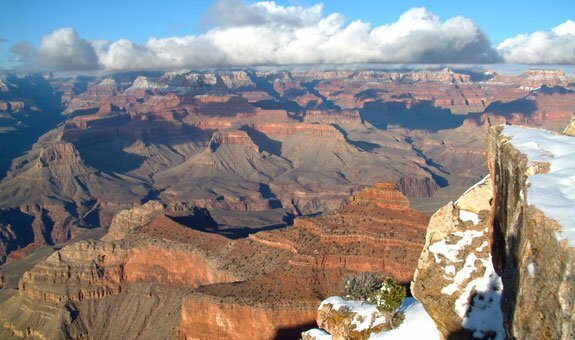 Finally, consider this: where you are standing used to be covered by at least 5,000 feet of sediments that have eroded away from the rim of the canyon. That’s not to say that the canyon was at one time 2 miles deep, because these layers have been eroding for a long time, probably even longer than the canyon has been in existence. But the layers that used to be at Grand Canyon now only exist in the lowlands around the park, at Painted Desert, up on the Navajo Nation lands, and on up into Zion and Bryce Canyon National Parks in southern Utah. You can thank erosion that you don’t have a 2-mile deep canyon to walk into! OK, you’re ready to go. Heft that pack on your back, make sure you have plenty of food and water, a good pair of boots, and wide open eyes, because this is going to be a treat! Remember that you are going back in time, so in order to tell this story as it happened, you have to turn it around and tell it the opposite order from this writing. Christa Sadler is a geologist, educator and naturalist with a serious addiction to the outdoors, rivers, deserts, mountains and chocolate. She has pursued research in archaeology, geology and paleontology across much of the globe, including searching for dinosaurs in Montana, fighting off dust storms and overly curious camels in the Gobi Desert of Mongolia, and steering clear of annoyed marine iguanas in the Galapagos Islands. Her articles and photographs have appeared in Plateau Magazine, Plateau Journal, Sojourns, Sedona Magazine, and Earth Magazine. Her books include There's This River… Grand Canyon Boatman Stories, an anthology of short stories and artwork by guides on the Colorado River (This Earth Press), and Life In Stone: Fossils Of The Colorado Plateau, about the fossil history of the region and its public lands (Grand Canyon Association). Christa newest publication, Dawn of the Dinosaurs: The Late Triassic in the American Southwest, was released in August of 2015 and is an update of the 1988 classic with all new text, new science, and new, expanded illustrations. Occasionally she makes it home to Flagstaff to sleep.